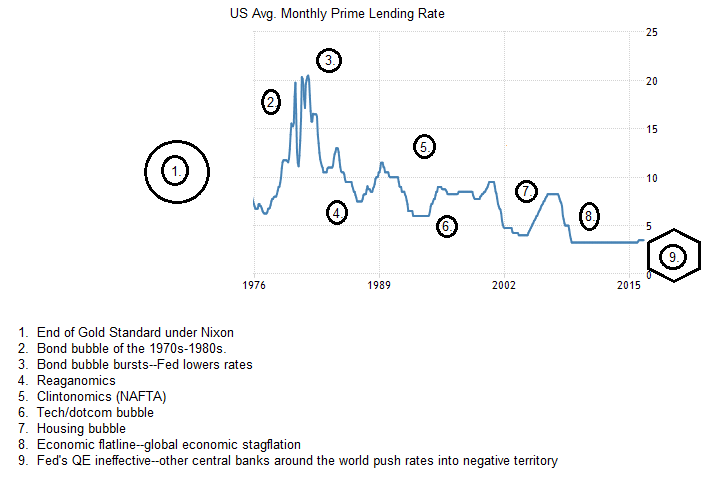 Research the history of the prime interest rate since 1980. Create a chart that shows the changing interest rate and depicts the economic and political conditions, factors, and reasons for the changing interest rate. Include a written summary of your findings. Your response should be 2-3 paragraphs (5-7 sentences). The prime interest rate peaked on 19 December 1980 at 21.50% from where it gradually declined 4% over the next four months before rising again to 20.50% by mid-1981. However, this marked the end of high interest rates, as from that point on the Fed took a sharp turn downward. By 1985, interest rates were at 10%. By 1992, they were at 6%. They flirted briefly with a return to 10% till 2000, whereupon the bursting of the tech bubble/dotcom bubble precipitated a further decline—4% by 2003—followed by a bounce back to a high of 8.25% in 2006 (at the height of the housing bubble—which burst the following year, bringing the market down with it). Today, rates sit at 3.5% and the Fed has been very cautious about raising them even just 25 basis points, eyeing a fragile global economy and surely taking note of the impact that a rate rise would have on certain asset classes (like real estate, stocks, and bonds). The economic factors that impacted the interest rate changes over the past three and half decades cannot be divorced from the Fed’s own economic policies and the political variables acting independent and interdependent of Fed decisions. For instance, the Fed hiked at the end of the 60s, when the Vietnam War was in full swing and the military-industrial complex was making billions with the war economy going full tilt. However, with the end of Bretton Woods and the dollar’s peg to gold—and the U.S.-Saudi alliance in the 70s, the petrodollar was born. The Iran hostage crisis had occurred at the end of Carter’s administration and ended with the election of Reagan. By the 1980s, the price of gold had risen some 300% from its 1970s high of $200 per ounce. Throughout the 80s and 90s, gold would ride a channel around $400 before dipping prior to a stratospheric launch in the 200s to more than $1800. All of this was courtesy of the inflationary practices of the Fed’s interest rate manipulation practices, bond bubble, its money printing (devaluation of the dollar), and QE following the housing crash of 2008. In short, the rate of inflation has never slowed since the 1970s. $40,000 spent on a home in 1975 would be worth $175,000 today—though the same home might not fetch that amount. Meanwhile, real wages for most workers have not changed since the 1990s, while the value of the dollar has declined. Low interest rates today are meant to boost the economy by encouraging people to spend rather than save—but because of debts (college, housing, etc.) money has low velocity and Fed policy is not working. Furthermore, it is being forced to buy a market that is historically overvalued in order to keep it from collapsing under its own illiquid weight. The chart below highlights pivotal economic and political points coinciding with the Fed’s prime interest rate policy since 1980 (Durden, 2013; GoldPrice, 2016). "U.S. Interest Rates Rise and Fall Essay." Aceyourpaper.com. Student Network Resources Inc, 21 August. 2017. Web. 18 April 2019. Student Network Resources Inc. "U.S. Interest Rates Rise and Fall Essay." Aceyourpaper.com. https://www.aceyourpaper.com/essay/us-interest-rates-rise-and-fall-essay/ (accessed April 18, 2019).